I lost another half a lb this week. A little low but given that I used something like 80pp at a friend's fortieth last weekend, I'll take it! Hopefully, we've been at Winchester Christmas market this weekend. As I write this (Friday evening...) it seems like it might not happen. D has been very up and down since he had his booster and flu jabs last week. He's complained of earache, had high temperatures, had afternoon naps - which is unheard of for him and he's had periods of extreme anger. Also not really like him. Very recently I discovered An Edible Mosaic. It's a great blog, filled with an excellent range of meals, from sweet to savoury and a few brilliant ideas for the future. I'll be going on a bit of a pinning spree when I have some time. I found this recipe for smoky roasted cauliflower and chickpea herbed dumplings and this immediately interested me - something full of flavour and without the dumplings, zero propoints. I love roasting cauliflower even though it's something I haven't been doing for very long, it regularly replaces the bog standard boiling that I used to do. Stats: - 6 servings, zero propoints/pointsplus per serving (if you made the dumplings, using 150g of gram flour instead of 180g, it would make for 2 propoints per serving). First, roast the cauliflower. Preheat the oven to gas mark 6. Spray the cauli with oil and sprinkle with half the salt. Roast for half an hour, turning the florets over halfway through. Meanwhile, mist a pan large enough for the whole soup (at least two litres) and over a medium heat sweat the shallot and carrot for eight-ten minutes, depending on the size of your carrot/shallot pieces. Add the garlic and fry gently for a further two minutes. 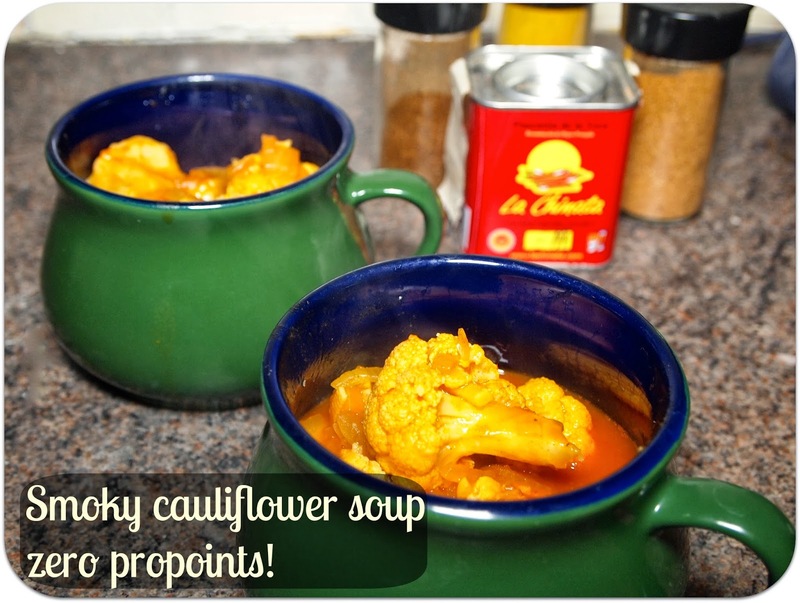 Add the rest of the ingredients (bar the cauliflower that is still in the oven!). Bring to a boil and then drop to a simmer for eight minutes. At this point, hopefully, your cauliflower is ready. Add this to the pan and cook for a further two minutes. Serve! No blending this week. 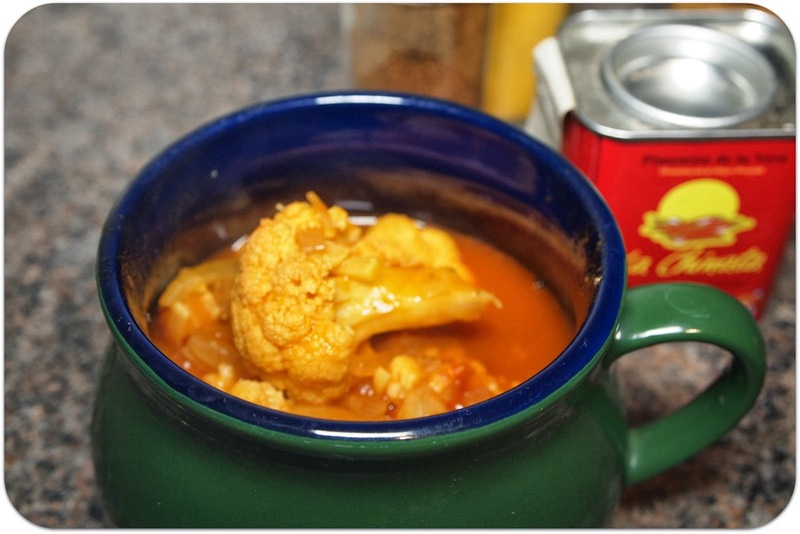 This is hearty soup that is probably a bit more like a stew but it has a really great kick to it. Just right for this time of year - and just the right amount of points in the run up to Christmas - means that I can get away with a skinny gingerbread cappuccino. I'm entering this soup for the Tinned Tomatoes December bookmarked recipes challenge.